Welcome to the Freeola Internet customer support pages. 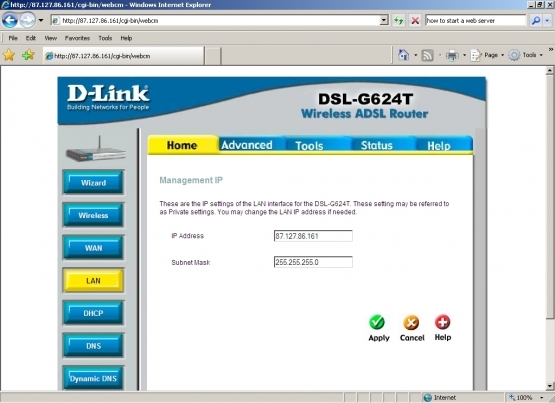 This guide is designed to help with setting up your D-Link Router to work with Freeola Broadband via a No-NAT connection. For more internet help topics please visit our main Support Page. If you are looking for general ADSL router configuration please visit our General Router Settings help guide. For a standard NAT enabled D-Link setup guide please click here. Please note that to establish a No-NAT connection you must have connected the router via NAT first. Most routers use NAT as the means to share one IP address among many computers. NAT also provides a natural firewall that will protect the computers behind it from access by unauthorized users. If you are looking to give each individual piece of equipment on your connection it's own IP address, or wish to run a private mail server, you will be required to disable this function giving you a No-NAT firewalled connection. Please note that No-NAT is a relatively complex product to set up, and unless you are experienced with networking, it is recommended that you stay with a standard NAT connection. Please also note that once you have switched a machine to a No-NAT connection, it will no longer be protected by the NAT firewall built into routers, and it is imperative that you employ a firewall to protect any machines that you use in such a way. Do not change your router settings unless you have arranged with Freeola to have your account No-NAT enabled, and you have been assigned your block of IP addresses. This can be done by calling Freeola Support on 01376 55 60 60. You will need to type in the default username and password to access it. By default both the username and password will be admin. If you have yet to make a connection to Freeola with this router please follow our guide to establishing a NAT connection first. A guide to do this can be found here. Once you have established a NAT connection follow from this point in the guide. Please change the options NAT and Firewall to Disabled before scrolling to the bottom of the page and selecting Apply. Now select LAN from the left hand menu and change the IP Address to the first IP which Freeola have issued to you. Enter 255.255.255.0 into the Subnet Mask field, then select Apply from the bottom of this screen. Do not close the browser window you have open to configure the router. You will now need to change the IP address of the computer that you are using so that it is able to see the router. In order to do this, go to the Windows Control Panel, and select Network Connections. Right click on Local Area Connection (Or your Wireless Connection) and select properties. Click on Internet Protocol (TCP/IP) text and then select Properties. A window similar to the one below will appear. Make sure that Use the following IP address is selected before entering the IP address you want to use, this would usually be the next IP address in the range you have been assigned. For example if you have been given 10.195.195.52 as the start of the range you can use any IP Address from 10.195.195.53 to 10.195.195.56. Enter in the Subnet Mask, this should be 255.255.255.248. 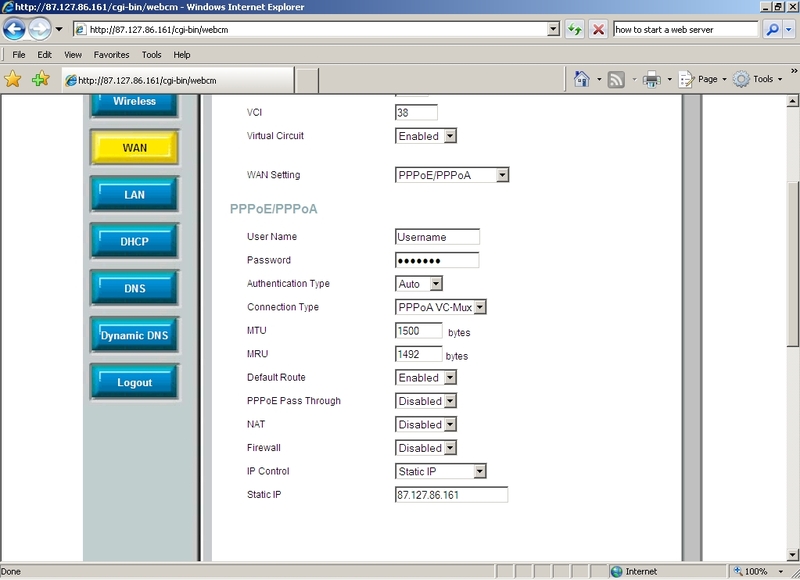 In the Default Gateway field enter the same IP address as you entered on the router in step 8. 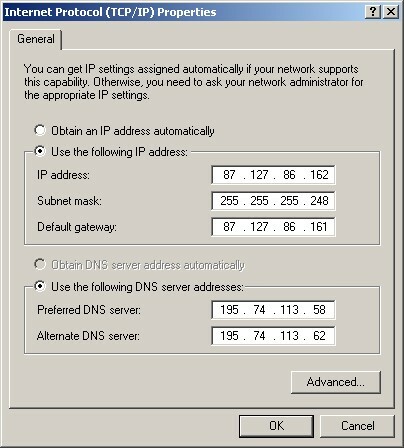 Ensure that Use the following DNS server address is selected and enter 195.74.113.58 in the Preferred DNS server and 195.74.113.62 in the Alternate DNS server. Click on OK and then OK on the properties dialog to save all changes and close these windows. You must now Save and Restart the router. To do this return to the open browser window in which you were configuring the router. Select Tools from the top of the screen, from the left hand menu select System, and from here select the option Save and Reboot. Once your router has re-booted this completes the process. Please be aware that any machines that you set up in this fashion will need to have their own firewalls in place as they will no longer be protected by the firewall on the router.